We are pleased to announce that our Asia Pacific Language Centre (APLC) was accorded 5 Stars under the SKIPS (Sistem Kualiti Institusi Pengajian Swasta) ratings exercise conducted by the Ministry of Education in 2014. APLC was among only 5 Language Centres in Selangor who were accorded 5 Stars – the highest SKIPS rating possible. A total of 150 Language Centres were Audited by the Selangor State Education Department in 2014 as part of this exercise, and a panel of Ministry officials had visited APLC in May 2014 for this purpose. The Audit Instrument used for the SKIPS assessment is very comprehensive, covering the full range of activities carried out, including areas such as Establishment, Management, Curriculum Development, Teaching, Learning and Assessment, Teacher Development and Student Discipline. APLC achieved an overall score of 96.46%, including earning perfect 100% scores in 3 areas – Teaching & Learning, Staff Management and Development, and Student Discipline. 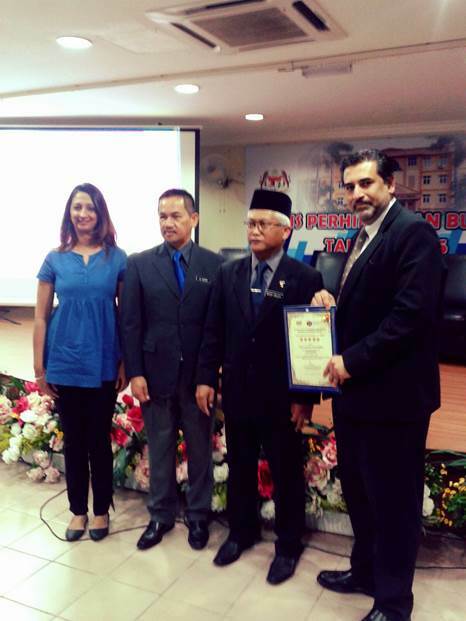 SKIPS rating Certificates were presented to selected Institutions during a ceremony which was held on Monday 14th September at the Selangor State Education Department, Shah Alam. Credit goes to Managers of APLC - Ms. Sharen and Pn. Haryati and all the staff of APLC who had put in tremendous effort before and during the SKIPS visit, and who have also worked continuously to ensure high quality teaching/learning delivery and management of APLC.